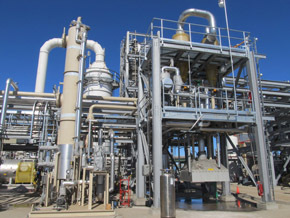 Bionomic Industries, a worldwide leading manufacturer of cutting edge syngas purification technologies, has recently provided gas cleaning equipment as part of a 20 ton per day demonstration scale Rentech-Clear Fuels gasifier at the Rentech Technology Center (RETC) in Colorado. Integrated with Rentech's existing Product Demonstration Unit (PDU), which consists of Rentech's Fischer-Tropsch Process and UOP's upgrading technology, the joint demonstration is designed to produce synthetic, renewable, certified drop-in jet and ultra low sulfur diesel fuels. Used to clean the reformer generated syngas, the gas purification process first begins with removal of the majority of ash and carbon particulate with Bionomics' dual stage high performance CycloPlusT collectors in a dry form. For final cleanup, the gas then enters a specially designed, nonfouling Bionomic Series 8500 Variable Throat Venturi Scrubber with a combination liquid entrainment separator and direct contact syngas absorber and gas subcooler. This final stage cleans the syngas within customer specified requirements by eliminating the remaining particulate, acid gases, heavy hydrocarbons and sticky tars to achieve an overall 99.5% contaminant free purified gas. The fully engineered system was provided as a complete Bionomic ScrubPacT skid-mounted, packaged unit containing all necessary equipment including liquid loop heat exchanger recirculation pumps, interconnecting piping/valve networks, instrumentation, and controls. A special Series 6500 Ejector Venturi Scrubber was also supplied in the Bionomic equipment scope package, with all required system components to remove the air entrained dust being emitted from the CycloPlusT Collector's discharge ash bin.